With the 2017 Major League Baseball season underway, you may want to keep up with your favorite team’s schedule. Given that the baseball season is at least 162 games (if your team doesn’t make the playoffs), who they are playing, where and when can be a bit of a challenge to keep up with day-to-day. Google, however, has made it pretty easy. In Google calendar, they have the schedule for all of the MLB teams but also for a wide range of other global sports such as cricket, rugby and football (or soccer as we call it in America). While you can’t add these calendars from the Android app for Google Calendar, you can sync them with it so you have your favorite team in your favorite sport schedule with you all the time. In this How To, I’ll show you were to go to add these calendars to your Google Calendar then how to sync them with your phone or tablet. Within each sport there are different leagues available and for global sports like Cricket, Rugby and Soccer, you will find leagues from all over the world. For this How To, and given the MLB season has just started, click on Baseball then click on Major League Baseball. Now you will see all of the teams for the MLB. Find your team then on the far right, click on the Subscribe button. Now your favorite team is a part of your calendar. If you go back to your main calendar view in Google Calendar, you will see that you now have your team’s calendar added to your own. The calendar will also update previous day games so you can see the final score if you missed it. 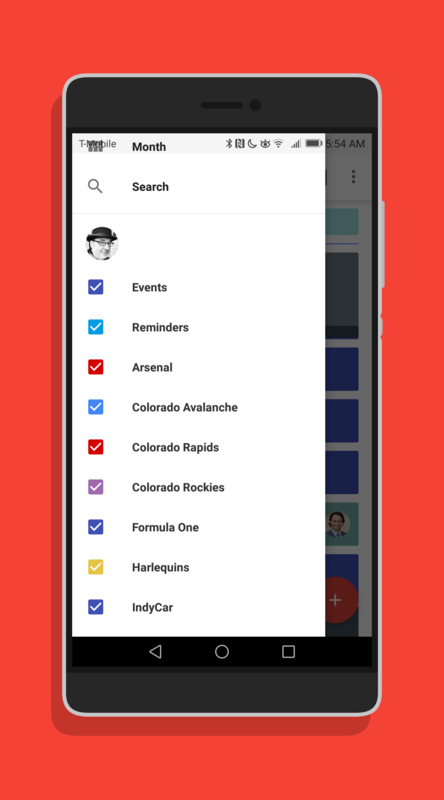 Now that you have your team calendar added to your account, you need to sync it with the Google Calendar app on your phone. To do this, open up the app on your phone then go to Settings. Under your Gmail address (your Google Calendar account on which you added the calendar), you will see a More button under your Events and Reminders calendar. Tap it and you will find your baseball teams calendar, in my case, the Colorado Rockies. Tap on the teams name then use the toggles switch at the top to enable Sync of the calendar. That’s it. Now the calendar will be synchronized with your phone. You can subscribe to multiple calendars in Google Calendar so you can follow all of your favorite teams. You can see all of mine on the screenshot to the right. There are, of course, plenty of other calendars for other sports out there than you can subscribe to in Calendar. To do this, just add the URL of the calendar via the “add via URL” link in Other calendars. For more How To’s, check out the How To’s section.